Jinnie is a Senior Trainer and Founder of the London Centre of Psychodrama. She is also a counselling psychologist and supervisor and has a private individual practice in West London. As well as heading up the Psychodrama Department at HMP Grendon Underwood she trains all prison staff working in forensic therapeutic communities as well as the staff at Millfield NHS forensic therapeutic community. She has recently been given the Terry Waite major award for "outstanding work with long term prisoners". This was awarded by the Butler Trust. Jinnie has pioneered psychodrama training in Greece, Ireland and London and has written and lectured widely on Psychodrama, in particular its use in treating eating and personality disorders and the forensic patient. Over the past decade she has made television and radio programmes for the BBC and Channel 4 using psychodrama and action methods. In 1996 she was invited to be a member of a scientific committee financed by the European Union and subsequently directly organised a psychodrama programme focusing on youth at risk in Greece, Southern Ireland and England and in 2008 organised a major conference at HMP Grendon on Transformation Through Confinement. Anna is registered as a Senior Trainer with the BPA. She works in private practice in East London with individuals, couples and groups; and consults to Maudsley and King's College Hospitals in particular supporting work in the fields of personality disorders and palliative care within the NHS. She is programme leader for the BPA accredited diploma in Creative Supervision. She has written about her work with people with learning disabilities, about supervision, and about creative advances in group work. As well as her clinical work she is a leader, conductor and performer in Playback Theatre and an active member of London Playback Theatre. Her training and facilitation work takes her regularly to Switzerland and Germany. Maxine Daniels is a registered Psychodrama Trainer with the BPA. She specialises in forensic psychotherapy. She works as a consultant and supervisor to the prison service for their offending behaviour programmes and trains prison staff at a national level in the use of roleplay as a therapeutic tool integrating psychotherapy and cognitive behavioural modalities. Maxine has delivered psychodrama groups in HMP Wandsworth and HMP Frankland - Westgate. She delivers workshops in Broadmoor hospital working collaboratively with staff who deliver substance misuse programmes to patients. She is published in the forensic field and is currently enrolled on a Doctorate Programme with Metanoia. Maxine works as a Consultant Supervisor and Psychotherapist to the Priory Group, Partnerships in Care and the Cygnet group medium secure hospitals. She is also the Director of Creative Forum a drama base training company working in public and private organizations, clients include, Breast Cancer Care, BP, Home Office, NOTA, Lord Chancellor's Dept. and Newham Health Trust. Kate works full time, for the Isle of Man Child and Adolescent Mental Health Team with young people from four to sixteen years. Her special interests are using psychodrama in Paediatric Liaison with young people who are physically ill and with young people with Asperger's Syndrome. Up until 2000, she worked as a psychodrama psychotherapist with adult and child patients who had life threatening or terminal illness. She has worked as a trainer using action methods in different settings: police services, fire and rescue services, voluntary organisations and in the Health Service. Her Master's degree research explored the application of psychodrama with clients who had been sexually abused. Her PhD research was into the impact of working therapeutically with clients who have experienced sexual trauma as adults or children. Past Honorary President, British Psychodrama Association. Former Board member, International Association of Group Psychotherapists and Group Process. Founder member of the Federation of European Psychodrama Training Organisations. Co-Editor of The Handbook of Psychodrama, Psychodrama Since Moreno, and Psychodrama: Inspiration and Technique. Marcia trains internationally in Geneva, Athens, Kiev, Spain, Moscow, Kazakhstan. She also conducts a private practice in Brentford. Hannah is an accredited Systemic Family Psychotherapist and UKCP supervisor with 20 years of experience working within the mental health service. Hannah currently works as Family Therapist at the regional adolescent in-patient unit and the University of Exeter, where she is Senior Lecturer and Academic Lead for the Child IAPT Programme, the MSc in Psychological Therapies and the Doctoral training in Clinical Psychology. Hannah has a particular interest in integrative practice and has additional training in group analysis, psychodrama and dramatherapy. She offers supervision and training, and specialises in couple and systemic therapy in her private practice - Changetree. Hannah presents nationally and has published on creative supervision, The Exeter Model and on the use of therapeutic spontaneity. Chris has been a qualified sociodramatist since 2008. He is also a qualified psychodrama psychotherapist (UKCP) and a registered mental health nurse. Chris currently works for a Mentalization Based Treatment (MBT) service in NHS mental health services in Bristol. He has used sociodrama as a developmental tool for teams within the NHS, local councils, universities, charities, and the non-statutory sector. He believes in the importance of both the individual and the group, and the inextricable links between the personal and the collective in social health and wellbeing. He has a history of active involvement in social campaigns. He is passionate and optimistic about the eternal potential for human beings to make creative changes whether it is in the therapy room or the workplace. Leandra Perrotta is an Italo-Australian Clinical Psychologist, Psychotherapist, Dance Movement Therapy Trainer and Jungian Psychodrama Trainer. 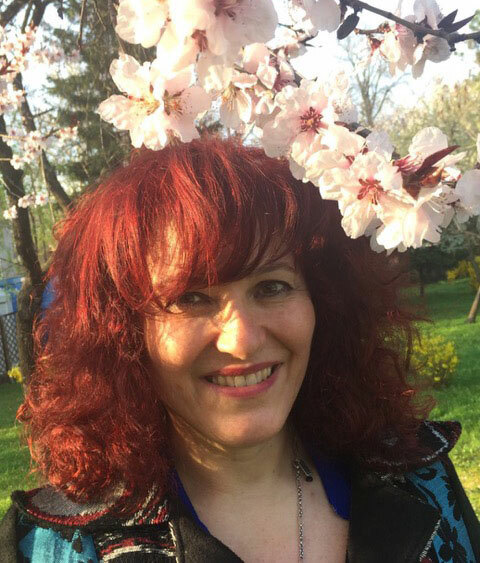 She is Contract Professor at the University of Valle D'Aosta, President of ITTA - International Association of Transgenerational Therapy and Past President of FEPTO - Federation of European Psychodrama Training Organizations. Leandra is a Trainer at IPAP - Psychotherapy Institute of Analytical Psychology and Jungian Psychodrama in Italy and at the Anne Ancelin Schutzenberger International School of Transgenerational Therapy. She is a member of the FEPTO Task Force for Peace Building and Conflict Transformation and has led groups of Psychodrama and Dance Movement Therapy in 25 countries around the world. Her professional interests include Dreams, Psychogenealogy, Sexuality and Trauma. Clark Baim, PhD, is a Senior Trainer in Psychodrama Psychotherapy (UKCP, BPA) and Director of the Birmingham Institute for Psychodrama. He is currently the Honorary President of the British Psychodrama Association. Clark is also on the faculty of the Family Relations Institute (Miami, FL. and Reggio Emilia, Italy), which is the training and accrediting body for practitioners of the Dynamic-Maturational Model (DMM) of Attachment and Adaptation. In 1987, Clark was the founding director of Geese Theatre Company UK, which uses applied theatre in criminal justice settings. From 1997 to 2002 he led psychodrama groups at HMP Grendon and for twelve years he was the Co-Lead National Trainer for the Probation Service's sexual offending treatment programmes in England and Wales. Teresa Brown is a UKCP registered psychodrama psychotherapist, trainer, and supervisor. Her life's work has been in the field of mental health, initially as an occupational therapist then as a psychodrama psychotherapist in the NHS. She has completed over ten years in Psychoanalysis. Currently she is working as a consultant to Glasgow University, provides supervision and therapy for art, drama and psychodrama psychotherapists, and is also a practising artist. Registered as both an integrative and a psychodynamic psychotherapist, with over twenty-eight years in private practice in London and psychotherapy teaching, John combines a long-standing interest in traditional relational psychotherapeutic approaches and Attachment Theory with Bioenergetic Analysis and other body and energy-based psychotherapies. He has served as External Moderator for the London Centre since 2005 contributing his knowledge of organizational development and course development, his ground-breaking work in university-level work-based learning and academic consultancy, and his accumulated experience as moderator for several other humanistic psychotherapy training institutes and external examiner for two Masters degrees. John is a Professional Member of the Association for Group and Individual Psychotherapy, an Active Member of the International Institute for Bioenergetic Analysis, a founder member of the British Association of Analytical Body Psychotherapists, a member of the International Attachment Network (London) and on the Metanoia Institute register.